This extension supports the following Networks. Hi robin. Adcolony extension by MAX is broken right now, Does Adcolony work in this extension? Hi, all supported network listed in first post works in this extension, so yes also Adcolony works, no need to have the separate extension, (does not works when the separate extension are enabled, does not compile). 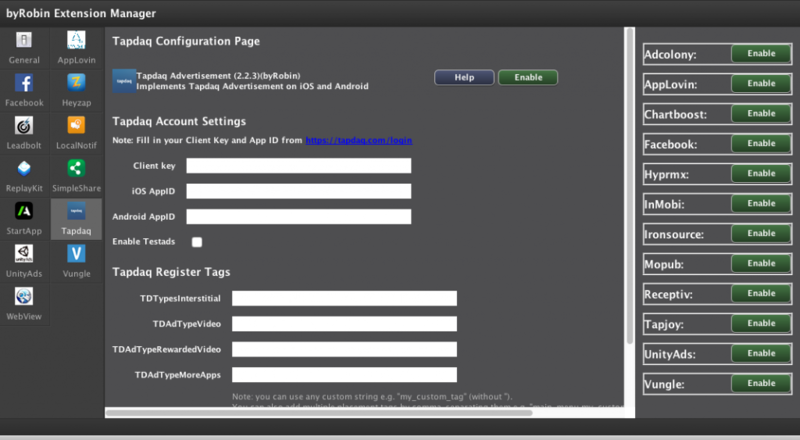 For the update of the Adcolony extension, let me think about that... (Whats you offer ). It seems the Tapdaq.framework is not linked, after download the extension. Try to update to version 1.8. 4) Unzip it and copy the Tapdaq.framework to "YOURDOCUMENTFOLDER"/stencylworks/engine-extensions/tapdaq-master/frameworks"
Thank you Robin! The second option worked. I had to replace the framework myself. Good work! Thanks for confirm, i have add the solution in the first post. When you publish with Stencyl you will get error ITMS 90179 when upload ipa with Application Loader. To Fix this you have to make an ipa with Xcode..